McDonald's occupies a position in Hawkhill Retail Park located on Stevenston Road, approximately a 1.01 mile driving distance north-east from the centre of Stevenston (not far from Ashenyards Park). The restaurant is a brilliant addition to the local businesses of Montgreenan, Saltcoats, Kilwinning, Stevenston Town Centre, Dalry and Ardrossan. Drop by today (Monday) from 6:00 am - 1:00 am. This page will provide you with all the information you need on McDonald's Stevenston, including the operating times, place of business address, direct telephone and more info. You'll find McDonald's ideally located near the crossroads of A738 and Stevenston Road, in Stevenston, Ayrshire, at Hawkhill Retail Park. 1 minute drive from Pennyburn Roundabout, Morrisons Roundabout, Hyslop Road and Morrison Avenue; a 5 minute drive from Kilwinning Bypass, Glencairn Street and A78 / Three Towns Bypass; and a 12 minute drive from Howgate or Byres Road. Trains operate directly to Stevenston Station (1.13 mi), Kilwinning Station (1.29 mi) and Saltcoats Station (2.09 mi away). Use the ScotRail line. Within a short walk there is St Johns Primary School, St Lukes Primary School, St John's Church, Hayocks Primary School, Hawkhill Cemetery and Former Explosives Factory. Currently, McDonald's operates 1 restaurant in Stevenston, Ayrshire. Check out an entire directory of McDonald's restaurants near Stevenston. 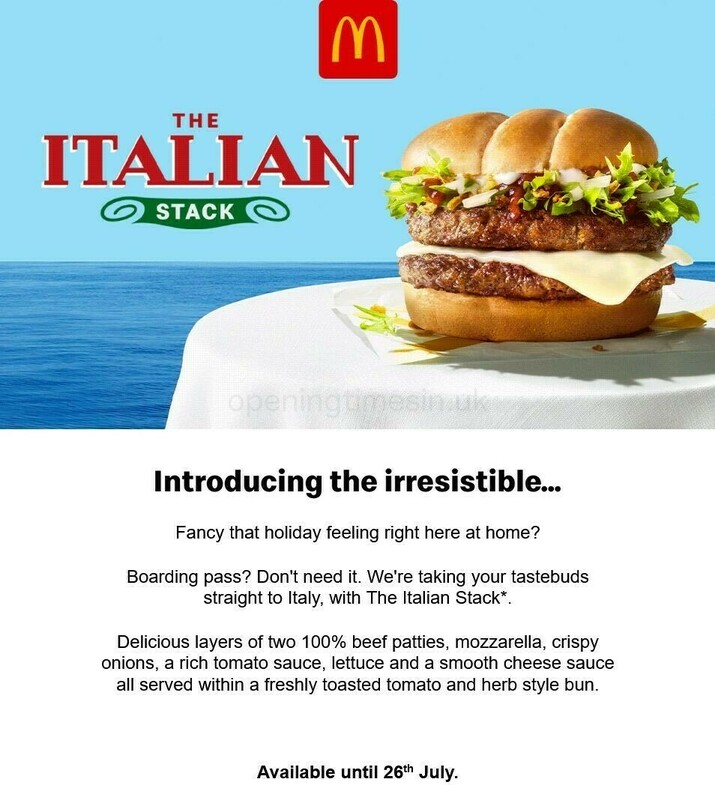 Please note: over the UK holiday period standard hours of opening for McDonald's in Stevenston may be revised. In the year of 2019 these alterations cover Xmas, Boxing Day, Easter Monday or Spring Bank Holiday. It's suggested that you visit the official site or call the direct line at 370 524 4622 to get further information about McDonald's Stevenston holiday open hours. Please be sure to peruse the wide variety of appealing stores at Hawkhill Retail Park. Located in this place you may also find McDonald's, B&M and Morrisons. We are always striving to deliver you with the most up-to-date information. Please feel free to utilize this form to report any errors with the address particulars or hours of business for McDonald's in Stevenston. You can also help future customers by posting your thoughts about McDonald's.